This piece first appeared in the Huffington Post. I was on the verge of succumbing to a Mother's Day pity party. My kids and my mother live more than half a continent away. I ached with missing them and, frankly, I was feeling sorry for myself. I also had a vague sense of guilt for not being with my mom because, at nearly 84, who knows how many Mother's Days she's got left? Last year, I was spoiled with many opportunities for family togetherness. A graduation, a wedding, all the kids here for Christmas. And now, it's been a long four and half months without them. I'm missing everyone gathered around a table, laughing, making music, breaking bread, communing. My mood was not improved as an appliance repairman held John and me hostage most of Saturday afternoon. He pulled our stove away from the wall and unloaded every conceivable tool from a paneled van that was blocking the garage. We couldn't get into the kitchen or out of the driveway. Even though we hadn't eaten since breakfast -- and I now had a working oven -- I wasn't about to start cooking when the repairman finally left at 4:30. "Let's go get an early dinner," John said. Quick, let me go tint my hair blue. Early Bird Special at Del Boca Vista? I shook off the vague notion that we were too young to go to dinner at that hour. Didn't matter. We were starving and headed to a lively place we'd tried for the first time a few weeks ago. It was jam-packed, had potent margaritas with tableside guacamole prep and servers in traditional Mexican costumes. There was an hour wait. We just didn't have it in us, but were now salivating for Mexican food and found another place nearby, courtesy of Yelp. Once we parked the car, we noticed a silver van with "Mariachi" stenciled on the windows. Hmmm... I thought about those trips to Mexico where the mariachis serenade you and don't leave your table until you produce a tip... I wondered if either of us had any singles. We were seated at a table near the patio, just enough inside to not be chilly. It had been cold here for days. And gray. And rainy... which no doubt had contributed to my case of the PLOMs (Poor Little Ol' Me). My friend in Pittsburgh was sweating in the upper 80s and here in LA we were all freezing because we've acclimated to warm temperatures and become wimps when the thermometer dips below 65. I had to dig out shearling boots and a ski jacket to walk the dog on Friday morning. We slept under a down comforter and debated whether to turn on the furnace. My curiosity was piqued and, with my reserve dissolved along with the salt around the rim of my margarita, I turned around in my chair and asked, "What's the occasion?" 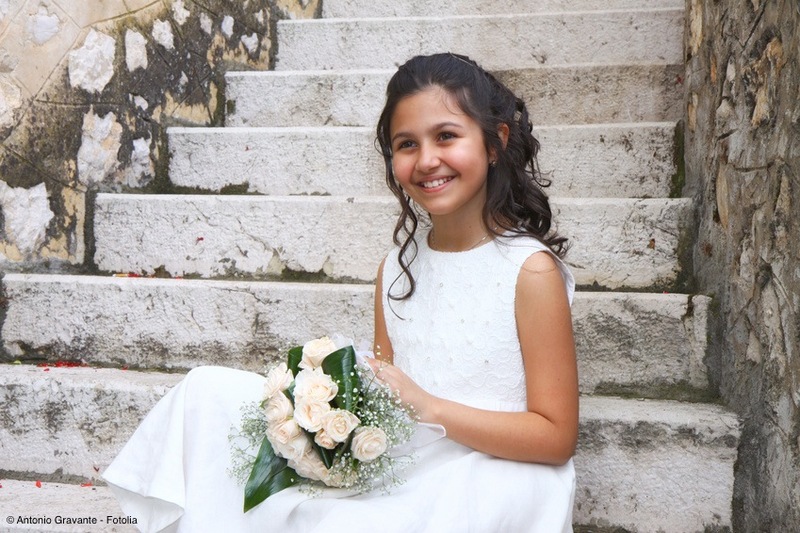 "It's my First Holy Communion," the girl said, bursting into a huge smile. 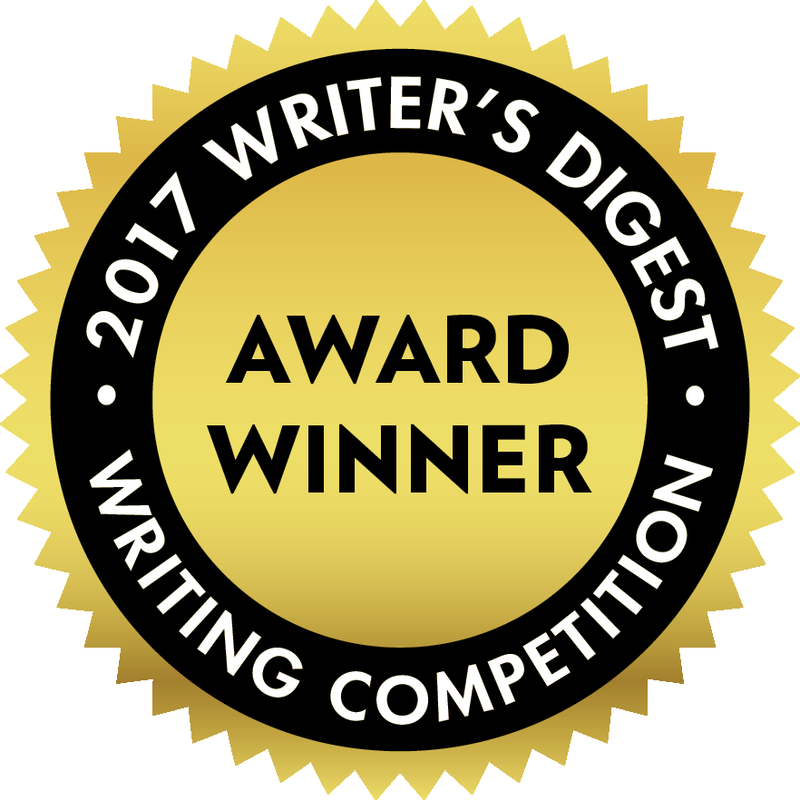 "Oh, congratulations!" I gushed, feeling irrationally proud of this precious stranger. A few minutes later, she appeared at our table with gifts. 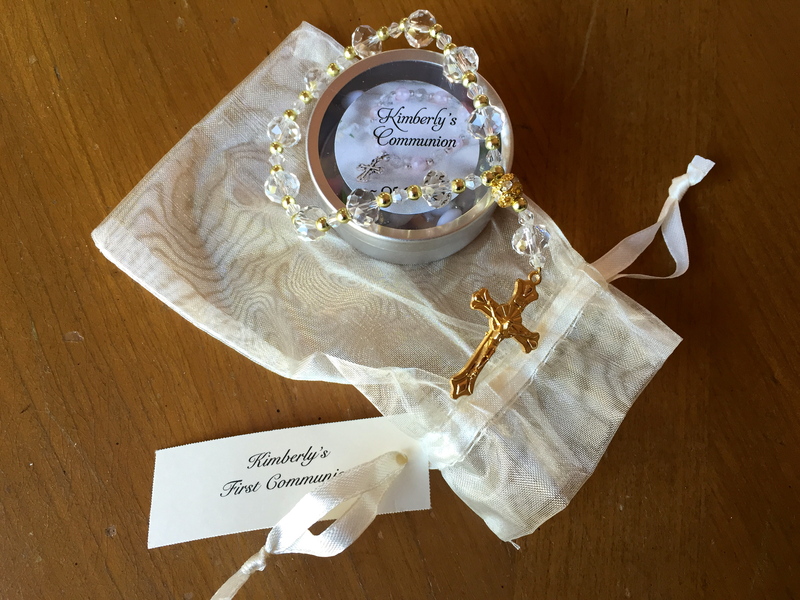 There was a little tin that looked to be filled with mints, and a small mesh bag containing a bracelet made of clear sparkly beads with a cross as a charm. Pre-printed labels told me her name was Kimberly. "Thank you, so much, Kimberly! That is so sweet!" She beamed back at me, clearly delighted that she had something to share with an outsider -- a sappy stranger whose eyes were now brimming with tears. "My kids are thousands of miles away," I told Kimberly. "I am missing them so much this Mother's Day. You've really made my day." The next time Kimberly returned to our table she bore goody bags -- boxes, actually -- printed with "Kimberly's First Communion," and filled with colorful Mexican candies not familiar to me: Pelon Pelo Rico, Rellerindos, Aldama, Duvalin, Pulp of Tamarind... Then she made the rounds, sharing boxes with some of the wait staff. I was moved by her generosity of spirit. The mariachis finished their set and a new band played "Girl From Ipanema" and "Besame Mucho." We were leaving, but Kimberly's party was in full swing as I stopped to speak to her mom on our way out. "Your daughter is beautiful. Inside and out," I said, patting my hand on my chest to emphasize her precious heart. "She has such a beautiful and generous spirit." I saw then where Kimberly had gotten her infectious smile and gorgeous brown eyes. When John and I headed out for tacos, I had no idea we'd walk into something sacramental. Indeed, if that first restaurant hadn't had an hour-long wait, we'd have missed this coming together of Kimberly's family and friends, complete with mariachis and the sugary vanilla candy rosary that came in the little tin I'd first thought held mints. We'd have missed the opportunity to receive the love and grace of this precious, young and faithful girl. Kimberly invited us to share in a Eucharistic rite of passage that was consecrated by the breaking of bread and tortillas, and the distribution of smiles and goodies in loaves-and-fishes abundance. We were in communion. And it was holy.